ANOTHER PIONEER GONE — Last Sunday evening, May 18, 1902, news was received from San Jose conveying the sad intelligence of the death of Juan INDART. Deceased had been in ill health for some months past and as his condition did not seem to improve at his home in Santa Anita, it was decided to remove him to San Jose, where the advantage of the best medical aid could be obtained. He was taken to the home of his daughter, Mrs. J.B. GARAT, where he received all the attention that loving hands could give, but which proved of no avail. At the time of his death, Mr. INDART had reached the ripe old age of 76 years. He was a native of France and had come to California via South America in 1851. 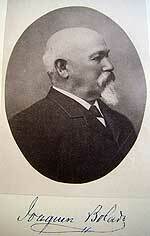 On his arrival here he engaged in mining in Calaveras county with varied success. He subsequently turned his attention to the live stock business, and with 2 partners, John ETCHEVERRY, now deceased, and J. YREBERRY, they did a profitable business in the several mining camps of the State. The firm purchased cattle in the southern part of the State and drove them to the mines where they were sold for beef at a large profit. For several years the firm conducted a large ranch in the Kings River valley, and in 1873 transferred their business to Tres Pinos. The firm continued in existence till 1882 when by mutual consent it dissolved and the property interests were equally divided. Mr. INDART’s portion being 3600 acres of the Santa Anita rancho, choice farming and grazing land. Mr. INDART was married in 1863 in San Francisco to Miss Mary ERRICA, also a native of France, and to them were born 6 children, who, with their mother, are left to mourn the loss of a dear and faithful husband and father. The children are Mrs. J.B. GARAT, of San Jose; Miss Domie and John INDART, of Santa Anita, and Peter and John Peter INDART, of Reno, Nevada. The funeral will take place today from the Catholic Church, where services will be held at 11 o’clock. The petition of Maria YNDART for the probate of the will of Juan YNDART [aka INDART], deceased, has been filed in the Clerk’s office. The real property consists of 1761 acres of the Santa Ana rancho adjoining the BOLADO estate, valued at $16,000; also 1769 acres of same rancho adjoining the town of Tres Pinos valued at $20,000… , all in San Benito county. 1878-08-20: Bolado from Sheriff of San Benito County. This Indenture, made the sixteenth day of August in the year of our lord one thousand eight hundred and seventy eight, between Benjamin F. Ross late sheriff of the county of San Benito in the State of California in the party of the first part, and Joaquin Bolado in the city and county of San Francisco in the said State party of the second part. WITNESSETH: Whereas, in and by a certain judgement or decree, made and entered by the District Court of the Third Judicial District, of the State of California in and for the said city and county of San Francisco on the eighth day of January 1878 in a certain action then pending in said court, wherein the said party of the second part was plaintiff and Estanislao Hernandez and others were defendants numbered in the calendar of said court 6065; in order to pay said plaintiff the sum of one hundred and seventeen thousand seven hundred and twelve 06/100 dollars due from said defendant Hernandez, it was among other things ordered, adjudged and decreed, that all and singular the mortgaged premises described in the complaint in said action, and specifically described in said judgement or decree, Should be sold at public auction by the Sheriff of the Said County of San Benito in the manner required by law, and according to the course and practice of said court; that such sale be made in the said county of San Benito, that any of the parties to Said action might become the purchaser at such sale; and that Said sheriff should execute the usual certificates and deeds to the purchaser or purchasers as required by law. And whereas, the Said party of the Second part thereupon paid to the Said sheriff the Said Sum of Money so bid by him for Said land. And whereas, the Said Sheriff thereupon made and issued the usual certificate in duplicate of the said sale in due form of law, and delivered one thereof to the Said purchaser.. And caused the other to be filed in the office of the County Recorder of said county of San Benito. And whereas, more than Six months have elapsed since the date of Said Sale. And no redemption has been made of the premises so sold as aforesaid, or by or on behalf of the Said Judgement debtor, on by or on behalf of any other person. Lots numbered on the map thereof made by SW Smith in May AD 1878.
by conveyances of record in Monterey County in Book O of deeds at page 456 (Corrected as 457) thereof and following (and?) portion of the Rancho Quien Sabe conveyed by Said Estanislao Hernandez herein to Said Joaquin Bolado herein on the fifteenth day of December AD 1873 and of record in Said Book O at page 456 thereof the whole of Said Tract hereby conveyed forming one body and containing nine thousand three hundred and nine and 81/100 (9,309 81/100) acres of land a little more or less together with all the rights privileges and appurtenances thereunto belonging or in anywise appertaining, and forming a part of the rancho known as Santa Ana. To have and to hold, all and Singular the Said Premises hereby conveyed, or intended so to be, together with the appurtenances, unto the said party of the Second Part his heirs and assigns, forever. In Witness Whereof, the Said party of the first part to these presents, has hereunto set his hand and seal the day and year first above written. Late Sheriff of the Said County of San Benito, State of California. May 1878 – Survey for Juan Yndart & Co. on file in San Benito County Recorder's office; by EJ Cahill. By invitation of a friend, we are induced to visit the residence of Señor HERNANDEZ, which is situated about 10 miles from Tres Pinos, in a southeasterly direction. Passing through the lands of Juan INDARTE on what is now declared a county road, we enter upon the domain lately owned by Señor BOLADO. On each side of our way we pass an extensive hill range over which the cattle roam in quiet retirement. After passing through several gates we catch a view of attractive fields of grain swayed into wavy motion by the zephyrs of the hills. Stately and brave old oaks stand like the sentinels of time forming groves of shade and furnishing a harbor for the little birds that whistle out their notes of melody and make “music in the air.” A farmhouse, outhouses, stables, barns, corrals, water tanks, and other improvements here represent the late home of Senor BOLADO. The house is well surrounded with shade trees and shrubbery and a well-cultivated garden is in the rear, where the vine, fig, cherry, peach, orange, cypress and blue gums grow and flourish. Water for irrigation and farm wants is conveyed from a mountain spring and the supply is about to be augmented by connection with a spring more distant. Springs about in every part of this extensive ranch. The wisdom of Señor BOLADO is exhibited in dividing the ranch into enclosed fields. All are fenced and all embrace a spring of water. The arrangement is an excellent one for the accommodation of stock. From our elevated point of observation, the eye ranges over a large part of the land recently purchased by Señor HERNANDEZ for $140,000. We learn that this gentleman contemplates moving his residence from Buena Vista ranch to this beautiful locality. He should also transfer the name of Buena Vista. We proceed on our way with our influential friend, whom we were fortunate in having with us, as he is one of the most expert gate openers and linguists in the country. We arrived before noon at HERNANDEZ’ ranch and were introduced to Jesus HERNANDEZ and Mr. MARSDEN, who treated us with gentlemanly consideration and courtesy. We had arrived at a busy time. 35 shearers were at work stripping the sheep of their fleeces and we looked upon the operation of shearing with some interest. Señor HERNANDEZ has but 1 shearing annually, so that his wool is always long and heavy–we were astonished to find some fleeces weigh 13 and 14 pounds each. Señor HERNANDEZ has directed his intelligent attention to the improvement of breeds and has among his immense flocks, through his experiments, a very superior stock. The general arrangement and management of the business is as perfect as possible and reflect credit upon Mr. HERNANDEZ and his assistants. Joaquin Bolado To Estanislao Hernandez. This conveyance made this twenty second day of the month of March A.D. Eighteen hundred and seventy five by Joaquin Bolado of the City and County of San Francisco in the State of California Grantor to Estanislao Hernandez late of the County of San Benito and now of the County of Santa Clara in the said State of California Grantee. And that portion of lot twenty-four (24) which was conveyed to said Grantor by one Juan Yndart on the twenty third day of December A.D. 1873 by conveyance of record in Monterey County in Book O of deeds at page four hundred and fifty seven thereof and following and that portion of the Rancho Quien Sabe conveyed by the said Grantee herein to said Granto herein on the fifteenth day of December 1873 and of record in said Book O at page 456 thereof the whole of said tract hereby conveyed forming one body and containing nine thousand and three hundred and nine 81/100 (9309 81/100) acres of land a little more or less. March 25, AD 1875 at 20 Min past 4 P.M. in Book 1 of Deeds Pages 587 + fol. Tuesday, December 23, 1873 – Juan Yndart sold to Joaquin Bolado 700.50 acres of Rancho Santa Ana [complex description of the parcel]; for consideration of $5.00.